Light Bright Carnelian Pillow Bead Strand - for confidence! 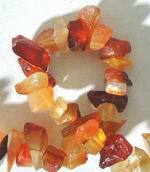 Sorry, we are currently sold out of 'Light Bright Carnelian Pillow Bead Strand - for confidence!'. Please check back later. 10 Striking Marquise Carnelian Beads - Unusual! Green Carnelian Lantern Frame Beads - Unusual! Yellow & Green Carnelian Nugget Beads - Unusual! 69 Deep-Red Carnelian Rondelle Beads 10mm- confidence!